The parish of Skeyton lies in north-eastern Norfolk between the market towns of Aylsham and North Walsham. There is no distinct village to the parish rather a discrete scatter of farms across an agricultural landscape and centred on a cross-roads of lanes. The most significant geographical feature of the parish is a stream, a north to south flowing tributary of the River Bure. All Saints church is close by the main cross-roads of the parish. 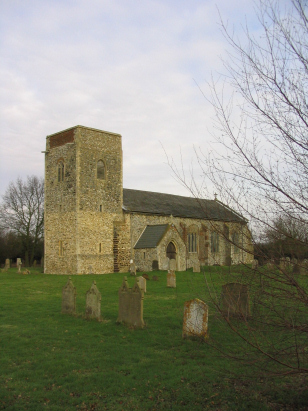 The church is early for Norfolk with many features suggesting the present church was around in the 13th century. 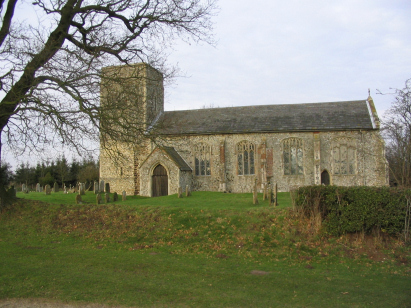 The rather squat and defiantly square tower is characteristic of a number of other churches in this area notably Felmingham. The church sits in a rather open graveyard with clipped hawthorn hedging which together with its hilltop location commands a wide view. The records covering the period of this transcription are recorded in a single 800-entry book which is filmed on Microfilm MF952 in the collection of the Norfolk Record Office and from which this transcript was prepared. The filming whilst rather poorer than contemporary films is adequate to its purpose largely due to the good state of preservation of the register. This was a straightforward transcription to prepare and hopefully few errors will have crept into its compilation.